Exciting 3rd Annual Ed Camp at Sandwich High School is a High Point of Summer Learning for Educators! 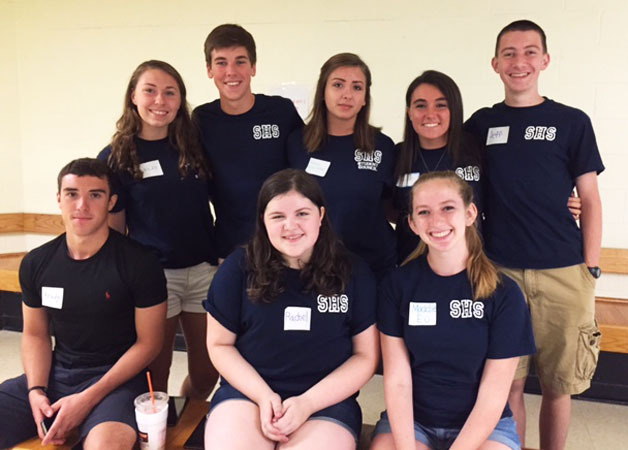 On Monday, August 3, 2015, 115 educators and administrators from 28 school districts across Massachusetts and beyond gathered at SHS for the 3rd Annual EdCamp Cape Cod. An impressive team of Sandwich Public Schools teachers and students organized and presented EdCamp, with the assistance of an EdCamp Cape Cod team who will host EdCamp 2016 in Mashpee. EdCamp is a gathering of those who want to learn and want to share their learning. It is often called an “unconference” to distinguish it from teacher Professional Development that is pre-organized around a particular topic or set of workshops. At EdCamp, participants arrive with questions they are hoping that others in the group can help them to answer and information that they are passionate about sharing. The EdCamp movement is now a global phenomenon. It started in the educational tech community but has spread and EdCamps are popping up all over for teachers in all content areas to learn and share. Many schools including Sandwich High School are adopting an decamp model for its monthly faculty meetings in the 2015-2016 school year. Schools who have lead the way in this approach have reported positive results and increased engagement among members of the school community. EdCamp models offer all teachers options and provide opportunities for all teachers to share ideas and learn from colleagues on topics which interest themEven the planning of EdCamp Cape Cod is shared out through Twitter months ahead of the event day, helping to create the positive energy and anticipation beyond the Cape. Many of this year’s participants came from off-Cape – educators here on vacation, and others who came for the day. 28 school districts were represented, from five states. EdCamp is free to participants, and supported by sponsors who donate breakfast, lunch and door prizes. EdCamp models a style of PD which translates into the proliferation of 21st century teaching and learning throughout participating schools. EdCamp also helps teachers to experience open sharing of ideas and practice not only at Ed Camp but beyond through a new network of twitter contacts. 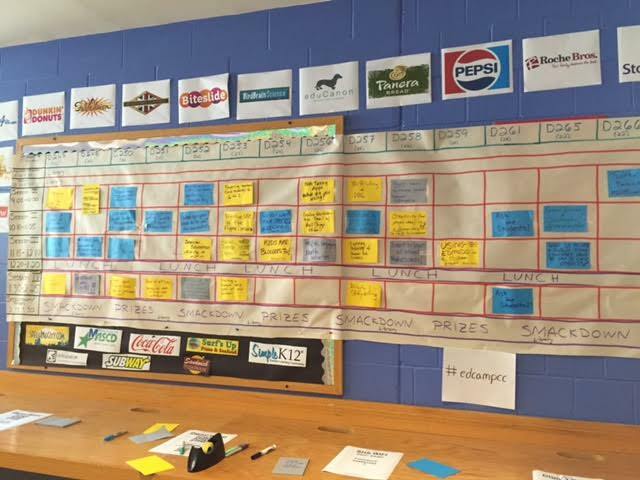 Teachers arrived at the Third Annual EdCamp Cape Cod to find an open-ended schedule. The schedule is created by the participants as they arrive.The slots quickly filled up with topics that some educators wanted to discuss and learn about and with information that others wanted to share. Problems and questions can be posed, or experiences can be shared. There is less a focus on an ‘expert’ and more of a shared common purpose/experience. Ed Camp classrooms in Sandwich High School’s 2nd floor D wing were arranged with circles of desks and chairs to promote the collaboration that is characteristic of EdCamp. Some classes – like one on Google Classroom – were packed! “Ask the Students” was a highly interactive and informative session for educators. Many thanks to the SHS students for their honesty and thoughtful insights. Twitter was busy with #edcampcc and #edcampcapecod postings that further shared the great learning and the great joy of EdCamp. The day wrapped up with a “Smackdown,” a lively exchange of ideas and prizes – an engaging combination! 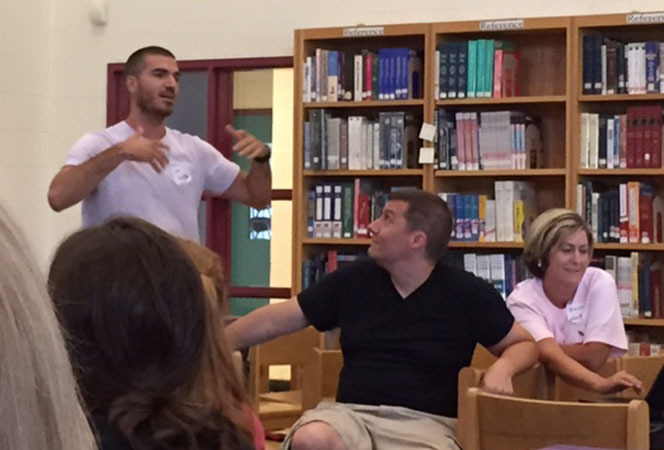 The Smackdown wrap up has become a signature feature of EdCamps and a feature that all enjoy. Dr. Richard Canfield, Superintendent of Schools; Dr. Ellin Booras, Principal – SHS; Bryce Harper – Director of Technology, Maureen Wiklund, Director of Curriculum; Chip Hill, Assistant Principal – SHS; Nancy Crossman, School Committee Chair; Beth Oman-Cummings, School Committee member. Sandwich STEM Academy Tech Integration Teacher Josh Rodrigues sharing some innovative ideas with his characteristic enthusiasm.